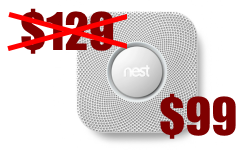 Last December I questioned the overall value of the $129 Nest Protect. I wasn't questioning the device's utility or features (it's quite cool) but rather the price versus the fact that it is programmed to stop working after 7 years. In that posting I chided Nest for not being more forthcoming about the purposefully-limited lifespan in the product's marketing materials and retail packaging. Some notable events have happened since that post. The upshot of those events is that the Protect's standard price has dropped from $129 to $99. Considering the average home would require multiple units for adequate coverage (as with any smoke alarm), the device is a decidedly better deal today than when first released. If you are in the market for the Nest thermostat or one of the two Nest Protect models then your least expensive option is to watch for a general discount coupon from your local home center store such as Lowes or Home Depot. Lowes routinely offers general discounts of 10% or more -- I saved $25 when buying my Nest thermostat. Check the Lowes page on RetailMeNot for current coupon codes you may be able to use when purchasing online (select the "in-store pickup" option to avoid shipping costs).